An old fashioned heroes vs. villains brawl, played out one card at a time. 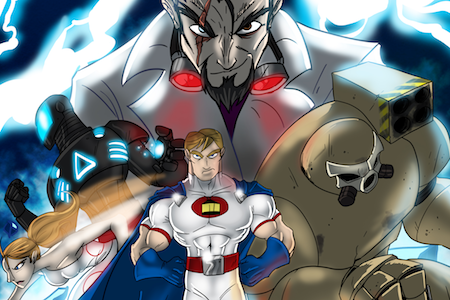 Sentinels of the Multiverse is a cooperative card game which pits the players as a group of superheroes battling against a unique super villain who is trying to destroy well, everything. You play as a group of three to five heroes battling one villain in a specific environment, each of the heroes, villains, and environments have their own unique card decks to be used during the game. Defeat the villain before your heroes are defeated, and you win. A turn in Sentinels consists of three phases: villain, heroes, environment. Each turn is straightforward. The villain turn consists of the villain’s active cards performing their action(s) then playing a card from the top of their deck. Each hero turn includes playing a card, using a power, then drawing a card. After all heroes have played, the environment uses its active card’s actions and then plays a new card. Fairly simple game play. The villain and environment cards mostly trigger when played and/or at the start or end of their next turns, so the heroes frequently have one turn to destroy the card before more adverse effects take place. It should be noted that the environment can target a hero or villain depending on its criteria. The heroes must drain the villain’s hit points (HP) before the villain destroys all heroes. Some villains have secondary defeat conditions which could result in an early loss for the heroes if they are met. The decisions in the game revolve around how to play your set of heroes’ abilities in tandem to provide the best combinations to attack the villain. It varies from hero-to-hero, but each has roughly 15 cards in their deck (with multiple copies of each) providing abilities. Each hero also has their own power described on their primary card. Add all of this up, and the fact that you play with three to five heroes per game, and you can see the longevity this game provides by having so many possible combinations. I can’t write any more without mentioning that this game is difficult. In general, the more heroes you use, the less challenging the game will be, but even at five heroes there aren’t any pushovers to be had in Sentinels, and the villains have some mechanisms to somewhat negate the advantage of using more heroes. The villain decks are unforgiving and if you get stuck with an unfriendly environment to go along with it, you might be in for a short game. The difficulty will be a major appeal to many and a major turnoff for others. More than most games we have reviewed around here, Sentinels is a game that demands a lot of effort if you really want to get a lot out of it. You will likely lose a bunch early on. You might have to use some of the easier hero/villain combinations to get that first win. That being said, that payoff is huge. The mechanics of each hero are really, really clever. Absolute Zero is one of my favorites. The power on his main card is to deal himself either one cold or one fire damage. Okay? That seems fairly dumb. However, playing that in conjunction with his other cards can either lead to huge gains in HP for himself, or huge damage dealt to opponents. On the flip side, if the villain is one that will wipe out player equipment or ongoing cards, Absolute Zero will have a tough time building up a powerful combo. The cards chain together so well, it takes a solid understanding of them to know how to play each hero, then another level of understanding to begin to understand how to best utilize different heroes' strengths together. And, of course, strategies change each game as the villains are wildly different. Some require brute force attack after attack, others require more finesse or damage control. And I'm only considering the base game here, the giant pile of expansions available add even more. The tutorial is lengthy but solid. It takes roughly 20 minutes the first time through and does a good job explaining the basic game actions available and how to perform them in the app. One of the complaints of the board game version of this is that there is SO much to keep track of. You will notice if you play the app that there are all kinds of damage increases/decreases in play at a given time, among other conditional effects. The app handles all of his bookkeeping for you, which greatly simplifies things. You will still often lose track of what effects are in play at any given time, but there is a handy icon at the top of the screen you can press to bring up the currently active effects and when you are choosing who to attack the net result of all effects is clearly displayed. Even with the bookkeeping, there is a lot going on and that can feel a little overwhelming to a new player. As with any card game of this type, play enough and you’ll learn the ins-and-outs of the cards. However, if you are picking this up having never played, it is probably going to be a while before you are totally comfortable with all of the cards, or at least comfortable with how to properly use each hero’s unique skill set. The app replicates the artwork of the source material, which I personally fine quite good. The comic book theme is maintained throughout and provides a great visual experience. There are animations and pleasing background visuals at every turn. The controls are simple and consistent. The app provides a nice shortcut where single tapping a card at a certain point will pop up a text box with what action that card will produce. This is a great feature to avoid the need to zoom in so frequently while learning the cards. I want make sure to mention that the game runs horizontally on a tablet and vertically on a phone. Kudos to the developers for making the effort to optimize each, they both work well. There is an extensive Undo option which allows you to go back to previous heroes' turns if you change your mind, this is very much welcome in a game of this complexity. Being a superhero game, there is, of course, lore behind the cards. This isn’t Marvel or DC, so the decades of backstory isn’t there, but the creators of the game have added a lore to these characters. The app provides a detailed backstory for each hero, villain, and environment if you are interested. Sentinels of the Multiverse features synchronous (live) online multiplayer for two to five players and is cross-platform. Teams are formed and you each control one or more heroes, depending on the number of players and settings. For the decisions in the game which require a choice, a round of voting takes place. If you should leave the app while playing, all of your decisions get made by your teammates through voting. This is a cooperative game so the desire for online multiplayer won’t be high for all, but it is there and is well done. However, the user base isn’t huge. There are always a handful (frequently a few dozen) players playing, but the lobby of players looking for games is consistently small and often empty. Online, this game is best if you have opponents lined up and can create a private game amongst yourselves. We must note that the online functionality of this game is frequently blocked by corporate and school networks. This isn’t uncommon among board game apps, but might be important to some. There is technically not a pass-and-play mode, but this is a co-op so it’s easy enough to create one by divvying up the heroes with a friend and playing on a large tablet. The single player includes you choosing which heroes you want to control, which villain you want to face, and which environment your battle shall take place in. You can pick each of these yourself or randomize the whole thing. The great thing about an app version of a co-op game is that you are playing a game that already has built in AI. There is no need for difficulty levels or smart AI opponents because there are no decisions for the AI to make, that is all built into the villain and environment decks. Individual games tend to be on the longer side for an app, they can range from 30 (a quick loss) to 60 minutes. This makes it a welcome addition that the game allows you to save and later resume a game in progress. The variety of different combinations included in the base game alone will give you plenty of different game options. The amount of possible combinations can be a bit overwhelming at first. The game helps here by providing a difficulty score for each villain and a complexity rating for each hero. Low complexity heroes and low difficult villains will be the place to start, and you can build up from there. The base game comes with ten heroes, four villains, and four environments. I don’t want to do the math, but that’s a lot of unique combinations right out of the box. Additionally, the game has a slew of expansions available as in-app purchases. You can buy them individually for $2-$8, or buy in bulk by purchasing Season Passes for $25. Currently, Season 1 is complete and Season 2 is rolling out. At the conclusion of Season 2, the app expansions will contain all of the available board game expansions. As of late 2018, there is only one remaining expansion that hasn't been released. The expansions are pricey for a digital game, but pale in comparison to the physical costs of the equivalent cards. The decision if the expansions will be up to the player, of course, but the sheer amount of content available for this app, should you choose to fully dive in, is quite staggering. We love seeing a game get this much support from the developer. As it stands, the game makes available (or soon will) everything that is available for the board game. That is always a welcome sight to see for fans of the digital versions. If you love this game and want to dive in, you can have a nearly endless supply of combinations to play. Sentinels is a game that really starts to shine the more you play. The intricacies of the heroes and how to best utilize their powers aren't something that will stand out the first time you use them. The cards have significantly more text than games of similar ilk, the powers/abilities are complex beasts. Put simply, this is not a pick up and play game. It's about as far from casual as digital ports get. The app shines because it automates all of the bookkeeping from the game. I really can't imagine playing the physical game with some of these combinations. The villain might have a dozen cards in play, and each hero could have three or four of their own. I'd go crazy trying to keep everything straight and would certainly fail in my attempts to do so. The app is an excellent port of the game and allows players to focus on their strategies rather than the bookkeeping. The game isn’t for everybody, but the price and replayability on the base app make it a smart choice for testing out the product before buying a physical copy, or to give players a more streamlined way play more frequently. If you are able to fully dive into Sentinels of the Multiverse, there isn't another solo game out there with this much content and depth. The barrier to entry is high, but the payoff is huge. A great port recommended for fans of the game who want more of it. This is a difficult solo game with nearly endless replay-ability.